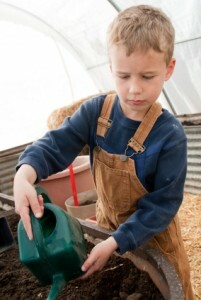 There’s nothing more fun than gardening with your kids or grandkids. I have a 5 year old grandson who loves two things: trucks and vegetable gardening. He gets so excited when he sees a garbage truck or a backhoe, but he gets even more excited when his tiny seeds break through the soil in the springtime. What about planting edibles that are just their size. How much fun to grow a watermelon that they can lift when it’s full grown. The Sugar Baby is a good size, about 8” in diameter. There are others that are even smaller but they are so small there’s nothing much to eat. Or check out The Rare Tigger Melon . It’s really beautiful, yellow with brilliant fire-red, zigzag stripes (just like Tigger) and golden color flesh. Only about one pound each, they are just enough for one little person. They’re easy to grow too. Try the Mini Bell Peppers . The fully grown bells are only about 1”. Nice for garnishes but even more fun for a child to grow. There’s even Tiny Blue Corn . Yellow too, but kids like the blue ones. The Blue Corn plants grow to just 2-3 feet. Not tiny, but very colorful and fun is the Carnival Blend of carrots. Last but not least, the Micro Tom Tomato . These are beautiful little plants and grow lots and lots of tiny tomatoes. For Christmas this past year, I gave little man Ford a PlantCam . I can’t wait to see the time lapse pictures he takes of his garden this year. He’s very excited, and so am I. Do you have other tiny fruits and veggies you can share with us? Next post: Early Blossoms on Greenhouse Seedlings – Disaster!